I wanted to write this article so you can throw together a sheet pan just based off what you have left in your fridge at the end of the week. I want you to be confident enough to put together a simple sheet pan dinner, that you know your family will love. You can of course use plenty of recipes to make sheet pan dinners, mine are at the end of this article. You can also, however, throw together your own recipes too, just using the meat and vegetables you have on hand. 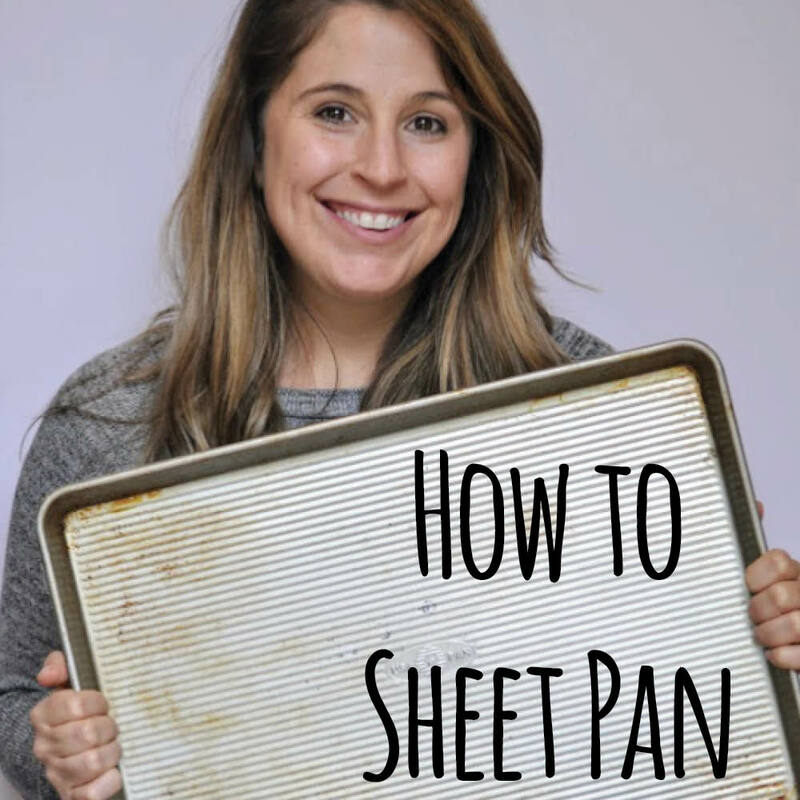 One note here, if you don’t have the money to go get a sheet pan. Just use your cookie sheet. Be careful with fatty meats and sauces, though. They might run over the edge so just watch it. The only other must, is parchment paper Can’t sheet pan without parchment. 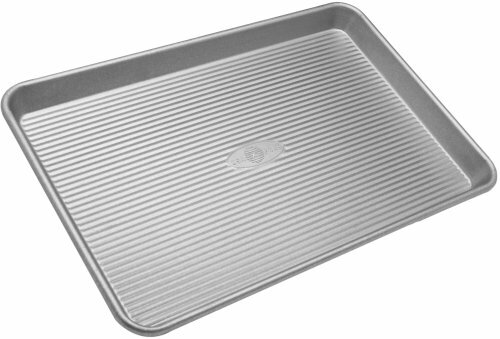 For a few reasons: makes clean up a breeze, helps foods cook evenly, and keeps things from getting soggy (ya’ll that word is the worse, but what else could I say here?). Like I say, “you have to eat your vegetables”. I typically do one starchy vegetable (corn, broccoli, cauliflower, butternut squash, potatoes, carrots) and one not starchy vegetable (asparagus, cherry tomatoes, green beans, kale, zucchini). This is by no means a have too, just a good rule of thumb. Starchy vegetables will always take longer to cook, so they are typically the first ones in the oven. Think of combos based off the vegetables your kids will eat. Potatoes pretty much go with anything. Broccoli does well as a stand alone because it is starchy and green! Fish does great from frozen, and takes no time to cook. Chicken breast does well if you tenderize it so it is the same thickness across. Chicken breast tenders cook way quicker than a full chicken breast. That is just chicken breast cut into tender sized pieces. Chicken thighs do better if they are skinless, because of the fat that is created. Ground meats make great bunless hamburgers. I love the way they cook perfectly in the oven. Don’t forget eggs! You can do a baked egg on top of cooked vegetables! So good! This is where it is at, where you can really bring a meal together. If you are new to this it can be challenge to know what to put together. Just start with salt and pepper on everything. For spices my recommendation is to buy a set of spices that are blends. I love balanced bites spices they are labeled so you know exactly what you are using: garlic trifecta, italian, greek, bbq, savory, ranch… you get the picture. All you really need to do is top everything with one of these. Is that to big of a step? Just get the 21 Seasoning Salute blend at Traders Joes and use that. If you want to use a sauce instead of a spice my only caution is read the ingredients. Go with something that isn’t full of sugar or fake oils. Here are some brands I like: Primal Kitchen, Tessemeas, and Annies Organic. Get creative - teriyaki with some pineapple in the vegetables or ranch on some sweet potato fries, marinate your chicken in italian dressing, or just use as a dip after you finish everything. Our bodies crave real fat, fat from nature. For you the most part on my sheet pans I use: avocado oil, coconut oil, and butter. Read this full article for all the details on how to pick a good fat. The whole goals is to get the same temperature oven for same amount of time to cook all your foods (vegetables and meats). It is achievable, but can be difficult. I pretty much always put my oven on 400 degrees to sheet pan. Then I think of what is going to take the longest. Do I have a large chicken breast that will take awhile or do I have sweet potato chunks that will take longer? Figure out how long each item will take. Then work backwards. For example, the chicken breast will take 25 - 30 minutes to cook and the broccoli will take 20 minutes. Season and oil the chicken, and put into the oven. Then set a ten minute timer, cut up your broccoli, and season (maybe with made some nutritional yeast). Then put on the pan when the timer goes off. Set another timer for 20 minutes then SERVE. This is about as complicated as it gets yall. Cut up your starchy vegetables smaller if you need to shorten the cook time. Use the broiler, very briefly, to crisp up any meat with skin, kale or spinach, or potatoes. If you aren’t sure how long a certain meat will take to cook just google a recipe really quick. I wanted to give a couple quick tips for plating. You can always throw a fresh herb on after the cooking is done. My favorite is cilantro. Another nice touch afterwards is a an avocado. Don’t be afraid to add sauce afterwards as a dressing. This can be a nice touch is your sure how to season something. Also makes for great dipping for the kids. Throw some fresh spinach under your meat and vegetables, to make a nice “warm” salad.